I'd been debating sometime in the future doing themes for each month's patterns. Some are obvious: Christmas, Hallowe'en, St. Patrick's Day...but I had also thought of picking a colour, or room, or maybe even a mood. This month, besides having St. Patrick's Day, wound up being GREEN. Crochet-wise! 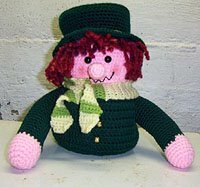 A leprechaun toilet roll cover (I thought he was cute, my husband and daughters thought he looked evil--I know leprechaun's can be tricky, but evil??? ), a green and white outfit for 4 1/2" dolls, a clover doily and a spring green dress for those 36" tall walking dolls. That dress and story is a previous entry. I've started Easter stuff now, working on some Eggheads. Crochet and computer time might be a little tricky this week with March break. Not that we're doing much, but between work and having kids home, my week's out of whack. Nuts. Time to wake up. And return to my small living room to work on my Eggheads and have some coffee.